She was equally persistent as a leader of a yearslong drive for a law to curb the widespread use of antibiotics in healthy cattle, pigs and chickens, a practice used to speed their growth. She and other critics said the practice had contributed to the emergence of bacterial strains resistant to antibiotics and capable of passing their resistance to human pathogens. But with livestock producers vigorously against the legislation, it had not been enacted at her death, to her great frustration. She had continued to call the stalling of the bill a bipartisan failure. Ms. Slaughter was chairwoman of the rules committee when Democrats were in the majority in the House from 2007 to 2010. The panel controls the debate and amendment process on the House floor, and she used its power to advance the Affordable Care Act, which passed the House by just five votes in 2009; all Republicans but one voted against it. Ms. 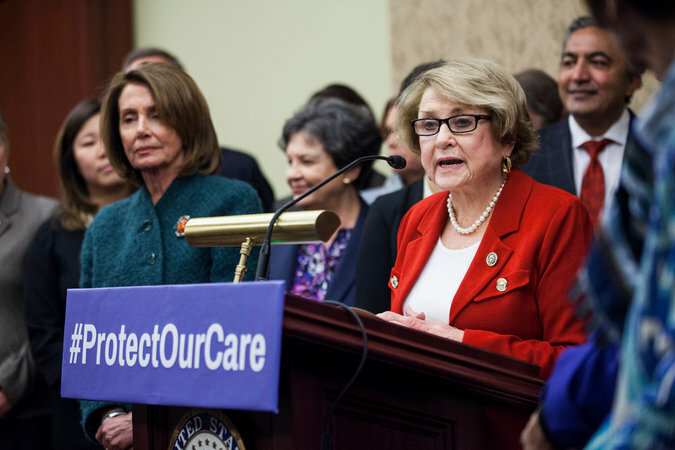 Slaughter spoke about women’s health care with Nancy Pelosi, the House minority leader, left, in Washington in 2017. Ms. Slaughter, who was known for speaking bluntly in her Kentucky drawl, also helped lead a successful effort in 1994 to enact the Violence Against Women Act, which included federal funds for domestic violence shelters and for training the police, prosecutors and judges to better understand and respond to violent crimes against women. She was also prominent in calling on the Pentagon to crack down on sexual assaults of women in the military. Ms. Slaughter publicly regretted one success. In 1991 she was one of several congresswomen who marched to the Senate side of the Capitol to demand, successfully, that Anita F. Hill’s accusations of sexual harassment against Judge Clarence Thomas be heard during his confirmation proceedings after he was nominated for the Supreme Court. Although Ms. Slaughter voted against impeaching President Bill Clinton in the scandal over his sexual activities with a young White House intern, she did not hide her anger toward him — and not only for what she deemed his reckless behavior in that episode. She had long believed that Mr. Clinton had made too many deals with the Republicans. Ms. 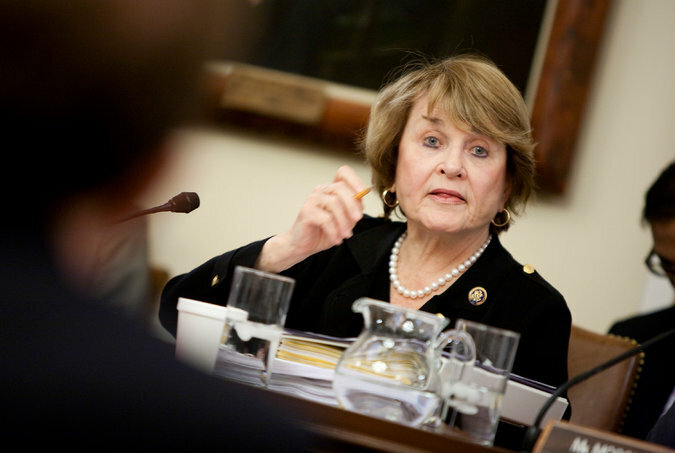 Slaughter oversaw a meeting of the House Committee on Rules in Washington in 2010, when she was the committee’s chairwoman. The House impeached Mr. Clinton, but the Senate acquitted him. In 2012, as President Obama signed a bill that banned insider trading by members of Congress, he praised Ms. Slaughter for having introduced the first version of the legislation six years earlier and continuing to fight for it. A longtime co-leader of the Congressional Arts Caucus, Ms. Slaughter was involved in the annual battles to increase, or at least maintain, funding levels for federal arts and humanities agencies. She also worked for economic development aid to combat the declining fortunes of upstate New York, where her district at times stretched west from the Rochester area to Buffalo and Niagara Falls. And she opposed treaties like the North American Free Trade Agreement, saying they contributed to job losses in the United States. Dorothy Louise McIntosh was born on Aug., 14, 1929, in Lynch, Ky., to Oscar McIntosh and the former Daisy Grace Byers. She was often described in news articles and some campaign materials as a “coal miner’s daughter,” but her father had actually worked for coal mines as a blacksmith, a spokeswoman for Ms. Slaughter said in 2015. He later owned his own business as a machinist. Ms. Slaughter graduated from Somerset High School, in Somerset, Ky., in 1947 and earned a bachelor of science degree in microbiology and a master’s degree in public health, both from the University of Kentucky, in the early 1950s. She worked in market research for a chemical manufacturer before she and her husband, Robert Slaughter, whom she married in 1957, moved to the Rochester area, where he had obtained a job. Mr. Slaughter, who worked for the American Can and Eastman Kodak companies, died in 2014. Ms. Slaughter is survived by their three daughters, Megan Secatore, Amy Slaughter and Emily Minerva; seven grandchildren; and one great-grandson. Ms. Slaughter began her career in elective office by serving in the Monroe County Legislature from 1976 to 1979. She served in the New York State Assembly from 1983 to 1986, when she won her first term in Congress by narrowly defeating a Republican incumbent, Fred J. Eckert. Ms. Slaughter was handily re-elected every two years until 2014, when, in a year in which the Republicans increased their majority in the House, she squeaked through to victory by fewer than 1,000 votes against her Republican challenger, Mark Assini, a town supervisor in the area. In a rematch with him in 2016, however, voters, by a 12-point margin, sent Ms. Slaughter, the dean of New York’s congressional delegation, back to Capitol Hill. Next article Nancy Pelosi Wants to Lead. House Democratic Candidates Aren’t So Sure.